Today was a very cold wet rainy Portland day. I remind myself on these days that this is the reason it is so lush and beautiful in the North West. But a nice warm cup of joe also helps. 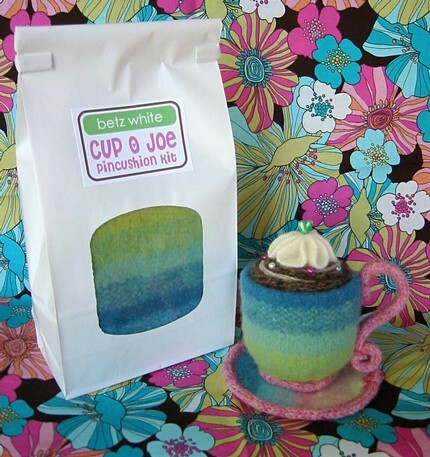 I rarely go one day without using my Betz White Cup O Joe Pincushion. I decided to go with the kit and make my own. I was really happy to find the directions easy to follow and the supplies truly great quality. In February 2007, Betz appeared on the Martha Stewart Show and has been featured in many magazines, including Country Living, Adorn and CRAFT. 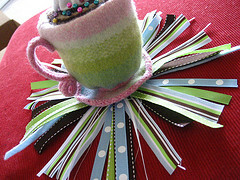 She is the author of the new book, Warm Fuzzies, 30 Sweet Felted Projects. This is maya! I would like to have a break from school! Love ya!